Goa Shipyard Ltd conducted ‘Run for Unity’ marathon on 31st October 2017 in a festive and patriotic atmosphere from SAG Sports Complex, Chicalim to Shantinagar, Vasco. 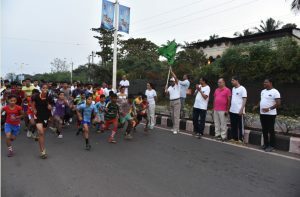 Over hundred enthusiastic participants, from various age groups participated in 5 Kilometres ‘Mini Marathon’, making it hugely successful. The Rashtriya Ekta Diwas (Run for Unity-05 km Run) marathon was organised country wide on the occasion of Birth Anniversary of Sardar Vallabhai Patel and is aimed to encourage and foster unity, brotherhood and patriotic mood across the nation thereby paying homage by the grateful nation to “Lauh Purush” Sardar Patel, who is credited with united India, post Independence. The event started with administering Unity Oath by RAdm Shekhar Mital, CMD, GSL and later on flagging off the mini-marathon to commemorate the 142nd Birth anniversary of Sardar Patel at SAG Complex, Chicalim. The Run for Unity saw the participation of large numbers of people including school students & CISF personals and GSL Officers. CMD also joined the race with the other participants, in his inherent style of leading from the front. RAdm Shekhar Mital, CMD, GSL said, the energetic spirit of participants in such large number have sent out a loud and clear message that ‘We Stand United’ ,‘Ham Sab Ek Hain’, ‘India is One’, in this momentous ‘ Journey of Growth’ India is presently transcending. Refreshments, Medical and emergency services were made available for the event. Local schools, RTO Vasco, Goa Police and Sports Authorities of India and Local Administration provided excellent support to GSL in making the event successful in the Sports Diary of city of Vasco- Goa.